The Sukhoi Su-24 (NATO reporting name: Fencer) is an all-weather interdiction and attack aircraft developed in the Soviet Union. The two-seat, twin-engined Su-24 carried the USSR's first integrated digital nav/attack system. It remains in service with former Soviet air forces and various export nations. One of the conditions for accepting Sukhoi Su-7B into service in 1961 was the requirement for Sukhoi to develop an all-weather variant capable of precision airstrikes. Preliminary investigations with S-28 and S-32 aircraft revealed that the basic Su-7 design was too small to contain all the avionics required for the mission. OKB-794 was tasked with developing an advanced nav/attack system, codenamed Puma, which would be at the core of the new aircraft. In 1962-1963, Sukhoi designed and built a mockup of S-6, a delta wing aircraft powered by two Tumansky R-21F-300 turbojet engines and with a crew of two in a tandem arrangement. The mockup was inspected but no further work was ordered due to lack of progress on the Puma hardware. In 1964, Sukhoi started work on S-58M. The aircraft was supposed to represent a modification of the Sukhoi Su-15 interceptor (factory designation S-58). In the meantime, revised Soviet Air Force requirements called for a low-altitude strike aircraft with STOL capability. A key feature was the ability to cruise at supersonic speeds at low altitude for extended periods of time in order to traverse enemy air defenses. To achieve this, the aircraft was expected to utilize two Tumansky R-27F-300 afterburning turbojets for cruise and four Kolesov RD-36-25 turbojets for STOL performance. Side-by-side seating for the crew was implemented since the large Orion radar antennae required a large frontal cross-section. To test the six-engine scheme, the first Su-15 prototype was converted into S-58VD flying laboratory which operated in 1966-1969. The aircraft was officially sanctioned on 24 August 1965 under the internal codename T-6. The first prototype, T-6-1 was completed in May 1967 and flew on 2 July with V. S. Ilyushin at the controls. The initial flights were performed without the four lift engines which were installed in October 1967. At the same time, R-27s were replaced with Lyulka AL-21Fs. STOL tests confirmed the data from S-58VD that short-field performance was achieved at the cost of significant loss of flight distance as the lift engines occupied space normally reserved for fuel. In addition, the use of lift engines precluded under-fuselage hardpoints and the aircraft was difficult to control during transition from STOL to conventional flight. On 7 August 1968, the OKB was officially tasked with investigating a variable geometry wing for the T-6. The resulting T-6-2I first flew on 17 January 1970 with Ilyushin at the controls. The subsequent government trials lasted until 1974, dictated by the complexity of the on-board systems. The all-weather capability was achieved thanks to the Puma nav/attack system operating in conjunction with Orion-A attack radar, Relyef terrain radar, and Orbita-10-58 computer. The crew was equipped with zero-zero Zvezda K-36D ejection seats. The first production aircraft flew on 31 December 1971 with V. T. Vylomov at the controls, and on 4 February 1975, T-6 was formally accepted into service as the Su-24. Picture - A Su-24 in flight. The Su-24 has a shoulder-mounted variable geometry wing outboard of a relatively small fixed wing glove, swept at 69�. The wing has four sweep settings: 16� for take-off and landing, 35� and 45� for cruise at different altitudes, and 69� for minimum aspect ratio and wing area in low-level dashes. The variable geometry wing provides excellent STOL performance, allowing a landing speed of 230 km/h (143 mph), even lower than the Sukhoi Su-17 despite substantially greater take-off weight. Its high wing loading provides a stable low-level ride and minimal gust response. The Su-24 had two Saturn/Lyulka AL-21F-3A afterburning turbojet engines with 109.8 kN (24,700 lbf) thrust each, fed with air from two rectangular side mounted intakes with spliter plates/boundary-layer diverters. In early Su-24 ("Fencer A" according to NATO) aircraft these intakes had variable ramps, allowing a maximum speed of 2,320 km/h (1,440 mph), Mach 2.18, at altitude and a ceiling of some 17,500 m (57,400 ft). Because the Su-24 is used almost exclusively for low-level missions, the actuators for the variable intakes were deleted to reduce weight and maintenance. This has no effect on low-level performance, but absolute maximum speed and altitude are cut to Mach 1.35 and 11,000 m (36,100 ft) . The earliest Su-24 had a box-like rear fuselage, which was shortly changed in production to a rear exhaust shroud more closely shaped around the engines in order to reduce drag. The revised aircraft also gained three side-by-side antenna fairings in the nose, a repositioned braking chute, and a new ram-air inlet at the base of the tailfin. The revised aircraft were dubbed "Fencer-B" by NATO, but did not merit a new Soviet designation. The Su-24's fixed armament is a single fast-firing GSh-6-23 cannon with 500 rounds of ammunition, mounted in the fuselage underside. The 'Fencer' installation of this weapon covers the gun with an eyelid shutter when not in use. There are eight external hardpoints (two under the inner wing glove, two swiveling pylons under the outer wing, and four on the fuselage) for a maximum warload of 8,000 kg (17,600 lb), including various nuclear weapons. Two or four R-60 (NATO AA-8 'Aphid') infrared missiles are usually carried for self-defense. Initial Su-24s had sparse electronic countermeasures equipment, with many Su-24s limited to the old Sirena radar-warning receiver with no integral jamming system. Later-production Su-24s had more comprehensive radar warning, missile-launch warning, and active ECM equipment, with triangular antennas on the sides of the intakes and the tip of the vertical fin. This earned the NATO designation "Fencer-C", although again it did not have a separate Soviet designation. Some "Fencer-C" and later Su-24M ("Fencer-D" by NATO) have large wing fence/pylons on the wing glove portion with integral chaff/flare dispensers; others have such launchers scabbed onto either side of the tailfin. The Soviets used some Su-24s in Afghanistan in 1984, and the aircraft saw combat again in the Chechen conflicts of the 1990s. About 1,400 Su-24s were produced. Substantial numbers of ex-Soviet Su-24s remain in service with Azerbaijan, Belarus, Kazakhstan, Russia, Uzbekistan and Ukraine. Roughly 415 are currently operational with Russian forces, split 321 with the Russian Air Force and 94 with the Russian Navy. 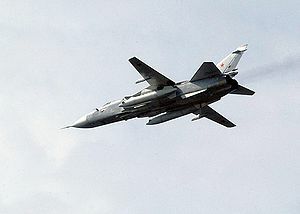 There are reports of Su-24s being used by Russia to attack Georgian targets in the August 2008 South Ossetian conflict.. The Moscow Defense Brief journal says that two were shot down by Georgian Buk-M1s. On 19 December 2008 a Su-24M bomber crashed near the southwest Russian city of Voronezh. A source in the Russian Defense Ministry said that according to preliminary information the crash was caused by a malfunction in the plane's flight control system, after which the pilots ejected. Su-24 is planned to be replaced by the Sukhoi Su-34 or another more advanced aircraft as long as Russian financial factors permit . Source: Sukhoi S6 An early project in the gestation of the Su-24, like a meld of the Su-7 and Su-15. T6-1 The initial prototype with cropped delta wings and 4 RD-36-35 lift engines in the fuselage. T6-2I / T6-3I / T6-4I; Prototypes for the variable geometry Su-24 production aircraft. Su-24 The first production version. Manufactured 1971-1983. Su-24M ('Fencer-D') Work on upgrading the Su-24 was started in 1971, and included the addition of inflight refueling and expansion of attack capabilities with even more payload options. T-6M-8 prototype first flew on 29 June 1977, and the first production Su-24M flew on 20 June 1979. The aircraft was accepted into service in 1983. Su-24M has a 0.76 m (30 in) longer fuselage section forward of the cockpit, adding a retractable refueling probe, and a reshaped, shorter radome for the attack radar. It can be identified by the single nose probe in place of the three-part probe of earlier aircraft. A new PNS-24M inertial navigation system and digital computer were also added. A Kaira-24 laser designator/TV system (similar to the American Pave Tack) was fitted in a bulge in the port side of the lower fuselage for compatibility with guided weapons, including laser-guided bombs and TV-guided bombs, and Kh-14 (AS-12 'Kegler') and Kh-59 (AS-13 'Kingbolt') missiles. The new systems led to a reduction in internal fuel amounting to 85 l (22.4 US gal). Su-24M was manufactured in 1981-1993. Su-24MK ('Fencer-D') Export version of the Su-24M with downgraded avionics and weapons capabilities. First flight 30 May 1987 as T-6MK, 17 May 1988 as Su-24MK. Manufactured 1988-1992, sold to Algeria, Iran, Iraq, Libya, and Syria. Su-24MR ('Fencer-E') Dedicated tactical reconnaissance variant. First flight 25 July 1980 as T-6MR-26, 13 April 1983 as Su-24MR. Entered service in 1983. Su-24MR retains much of the Su-24M's navigation suite, including the terrain-following radar, but deletes the Orion-A attack radar, the laser/TV system, and the cannon in favor of two panoramic camera installations, 'Aist-M' ('Stork') TV camera, RDS-BO 'Shtik' ('Bayonet') side-looking airborne radar (SLAR), and 'Zima' ('Winter') infrared reconnaissance system. Other sensors are carried in pod form. Manufactured 1983-1993. Su-24MP ('Fencer-F') Dedicated ELINT variant, intended to replace the Yak-28PP 'Brewer-E'. First flight 14 March 1980 as T-6MP-25, 7 April 1983 as Su-24MP. The Su-24MP has additional antennas for intelligence-gathering sensors, omitting the laser/TV fairing, but retaining the cannon and provision for up to four R-60 (AA-8) missiles for self-defense. Only 10 were built. Surviving Su-24M and Su-24MK models are going through a life-extension and updating program, with GLONASS, upgraded cockpit with multi-function displays (MFDs), HUD, digital moving-map generator, helmet-mounted sights, and provision for the latest guided weapons, including R-73 (AA-11 'Archer') air-to-air missiles. It is unclear if the Su-24MR and Su-24MP will receive the cockpit and navigation upgrades. The upgraded aircraft are designated Su-24M2. Algeria 39 purchased for the Algerian Air Force where 32 Su-24MK (upgraded to Su-24M2 standard) and 4 Su-24MR examples remain in service Angola Unconfirmed reports that the Angolan Air Force bought some 12 Su-24s from an unidentified source, possibly Belarus; one Su-24 was seen in 2008 at Catumbela AB Azerbaijan 11 in service with the Azerbaijan Air Force as of November 2008. Belarus Inherited from the Soviet Union, 34 serve with the Belarusian Air Force, consisting of 22 Su-24MK and 12 Su-24MR Iran 24 to 36 purchased for the Islamic Republic of Iran Air Force after the Iran-Iraq war Iraq 30 delivered to the Iraqi Air Force, 5 destroyed in gulf war, 1 survived in Iraq and 24 flew to Iran where they were pressed into service for the IRIAF; Kazakhstan 25 in service with the military of Kazakhstan Libya 8 Su-24MK purchased for the Libyan Air Force, 6 still on inventory, one destroyed in fire. Russia 415 in use as of November 2008. Russian Air Force - 321 aircraft in service as of November 2008. Russian Naval Aviation - 94 in service as of November 2008. Soviet Union Passed on to successor states. Syria Reports of as many as 20 in service with the Syrian Air Force Ukraine 230 Su-24s in service as of November 2008. Up to 8,000 kg (17,640 lb) ordnance on 8 hardpoints, including up to 4 x� Kh-23 (AS-7 'Kerry') radio-command missiles; up to 4 x� Kh-25ML (AS-10 'Karen') laser-guided missiles; up to 2 x� Kh-28 (AS-9 'Kyle'), Kh-58 (AS-11 'Kilter'), or Kh-31P (AS-17 'Krypton') anti-radiation missiles; up to 3 x� Kh-29L/T (AS-14 'Kedge') laser/TV-guided missiles; up to 2 x� Kh-59 'Ovod' (AS-13 'Kingbolt') TV-command guided missiles, or KAB-500KR TV-guided and KAB-500L laser-guided bombs. 2 x� R-60 (AA-8 'Aphid') air-to-air missiles are normally carried for self-defense; upgrade aircraft can carry R-73 (AA-11 'Archer') as well.